In recent weeks, Kim has taken to resurrecting bold runway looks of the past — i.e. some good ol’ fashioned leopard print Alaïa. But, as fans have been quick to point out, much of the 38-year-old’s vintage finds have all previously been worn by one particular supermodel: Naomi Campbell. To be fair, it’s literally Naomi Campbell’s job to wear a lot of different designs from the biggest names in fashion, so it’s inevitable that a celebrity will end up wearing something that she has also worn. That being said, the odds of this coincidentally happening more than three times in the past year are not high. 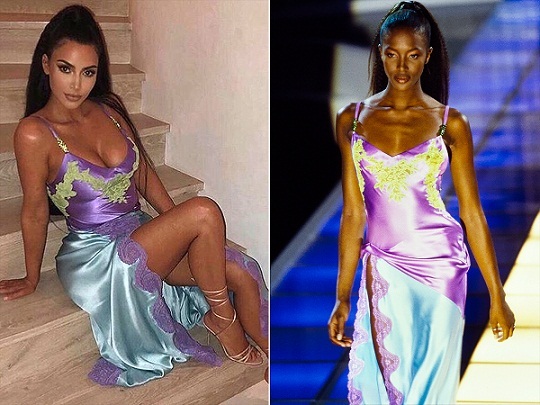 Naomi, too, subtly threw shade, posting a photo of herself from the ’91 Alaïa runway days after Kim began dressing in the collection’s leopard print wares. Kim’s youngest sister, Kylie Jenner, soon doused the fire in more designer fuel when she posed in a pair of diamond-encrusted sunglasses and a choker cuff which bore a striking resemblance to the Rifat Ozbek accessories Campbell wore down the runway in ’95.